Large, utility-scale wind turbines are fantastic and can generate a lot electricity, but they also require a lot of land and infrastructure. What if we could harness the power of the wind closer to home in an unobtrusive way? 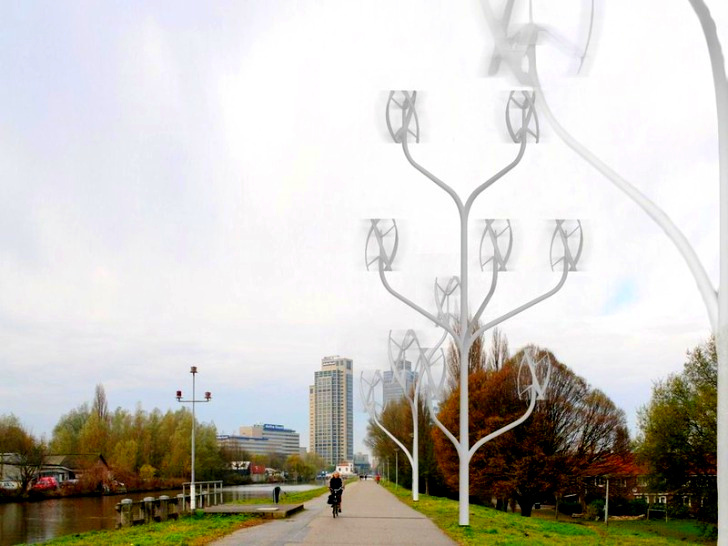 NL Architects explored this idea of 'domesticating' wind power with Power Flowers - tree-like structures outfitted with multiple vertical axis wind turbines. These small, almost noiseless generators could be placed in urban settings and serve as both distributed generation and artistic sculptures. NL Architects has been exploring the idea of advanced wind power generation since 2006 and Power Flowers is their latest iteration. Vertical axis wind turbine technology has advanced their ideas to capture even more wind and become more efficient. Power Flowers relies on 4 kW Eddy turbines by Urban Green Energy and mounts them in groupings of either 3 or 12. These wind trees need less space, can be installed where the power is actually used, create very little noise, do not need to be directed into the wind and have an interesting and aesthetically pleasing design. Power Flowers could easily be integrated into the urban landscape similar to cell phone towers, lights, electric poles and art sculptures. Less land intensive than even a pole-mounted residential horizontal axis wind turbine, the Power Flowers could easily fit in a back yard. By domesticating wind energy into a form that can be used as distributed generation, we can make wind power more accessible for everyone and as easy to integrate as rooftop solar systems. 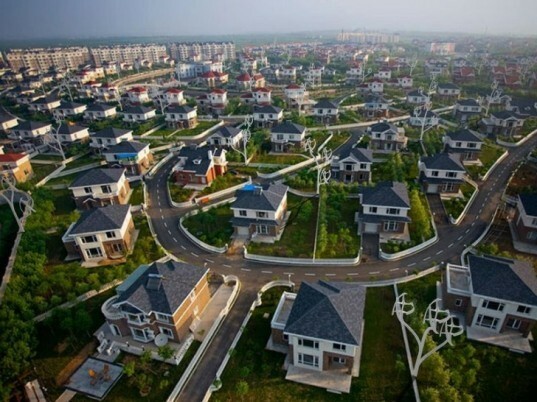 I frome china .I want to know more .and is it have be used already? Why is everyone so worried about birds??? Just a little FYI, wind power causes far fewer losses of birds (approximately 108,000 a year) than buildings (550 million), power lines (130 million), cars (80 million), poisoning by pesticides (67 million), domestic cats (at least 10 million)... If you want to save birds, get rid of your cat. we are working in renewable energy with Tunis and we would like to know more about your product. Hi, I am interested in this. Can you send me more details? I am working for company that is looking for this kind of products. Please contact me? to solve the bird issue u could put grates around the turbines. im sure they could make em look as purdy as those power flowers r! Yes, what about the birds! The tree turbines are cool. Tell me more. Interesting, but are there any locations up and running? If so, where? wonderful idea, but what about birds, what will they think, will they be safe...........???? NL Architects has been exploring the idea of advanced wind power generation since 2006 and Power Flowers is their latest iteration. ertical axis wind turbine technology has advanced their ideas so capture even more wind and become more efficient. Power Flowers relies on the 4 kW Eddy turbine by Urban Green Energy and mounting them in groupings of either 3 or 12. These wind trees need less space, can be installed where the power is actually used, create very little noise, do not need to be directed into the wind and have an interesting and aesthetically pleasing design. Power Flowers could easily be integrated into the urban landscape similar to cell phone towers, lights, electric poles and art sculptures. By domesticating wind energy into a form that can be used as distributed generation, we can make wind power more accessible for everyone and as easy to integrate as rooftop solar systems. Less land intensive than even a pole-mounted residential horizontal axis wind turbine, the Power Flowers could easily fit in a back yard. Power Flowers could be placed in almost an urban setting. Or even be used as monuments. Since the Vatican is the one of the greenest states in the world, they might even approve of this suggested upgrade. Power Flowers could come with 3 or 12 wind turbines. Wind energy distributed generation has numerous benefits.